Finally… A New Project Completed. Happy New Year to all of you blog readers! After kind of a long hiatus away from woodworking, I got back into the shop this past holiday season to build a project requested by my youngest daughter. Her husband is active military, and she wanted to present him with a wall-hanging holder for his collection of challenge coins. The red stripes of the U.S. flag feature shallow shelves on which to display the coins. The flag itself is cut from a sheet of ½ Baltic birch ply, and the shelves are made from sticks of ½ inch square dowels and ¾ inch wide thin edging strips, all obtained at the BORG. The stars are packaged thin plywood from the craft aisle at Wally World. Since I only had two days before Christmas to knock this project together, I had to resort to some quick and easy solutions. Of course, the whole project was built using only hand tools. The most time consuming part of the build was in designing the flag itself. A quick check online yielded official dimensions for the U.S. flag – element lengths/widths, star pattern dimensions, etc. This flag was scaled to match the size of the wooden stars I had on hand, so the flag itself measures 20” high by 38” in length. 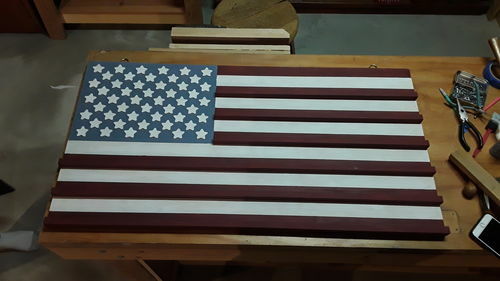 Once the dimensions were established, it was just a matter of layout on the plywood sheet, gluing on the stars, cutting and glue-up the shelf assemblies, gluing these to the flag, and painting the entire piece. I was forced to use every single clamp in my possession to get this all done, assembly line fashion. After each shelf was attached to the flag, my daughter set to work with the paint brushes. Finally, when all was dry, the flag was turned upside down and wire nails pounded into the backside to re-enforce the coin shelves. As a last touch, I fired up my wood-burning pen which my daughter used to sign and date the piece on the back. This was quite a fun project to work on with my daughter, and her hubby was definitely pleased with the result! Not sure if it was driven by efficiency…more like panic!